Sankranthi is an important festival in Telugu household. It is celebrated for 3 days - Bhogi, Sankranthi and Kanuma. How to explain the importance of this festival to our kids in this city lifestyle? It's a bit difficult as very few traditions are being followed now. 1. Sankranthi is the time when the Sun moves from the southern hemisphere to Northern Hemisphere (transition of Sun from Sagittarius to Capricorn Zodiac sign). This means The Sun becomes closer to us in India and weather becomes warmer slowly. 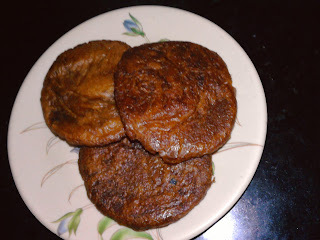 This is also called as 'Makara' sankranthi because of the transition of Sun to zodiac sign Capricorn (Makara raashi). 3. In villages, there is a tradition of 'Haridasu' coming to every home singing the prayers of Lord Vishnu. We offer rice and money to them.Other traditions include dancing of Gangireddu (decorated bulls make feats before every home as per the clarinet music of owner) and young women placing 'Gobbemmalu' (prepared from Cow dung and decorated with flowers) on rangolis and dancing around it singing songs. 4. On the first day 'Bhogi', People light bonfire with wood and burn old things indicating the new beginning. In the evening, families with infants or children below 3 years old will arrange a small function and shower 'regupallu' (jujube fruits) on their head. This will reduce evil eye on kids. 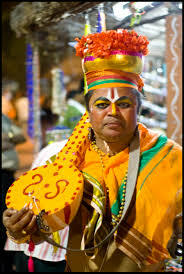 Some families arrange 'Bommala koluvu' on this day, which means arranging idols and toys in an organized way. 5. On the second day, which is Makara Sankranthi, People wear new clothes, do pooja and make offerings to ancestors of the family who died. 6. 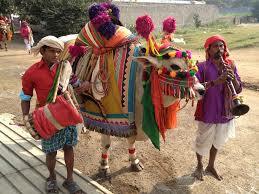 The third day is known as Kanuma, when farmers pray and honor the cattle. 7. 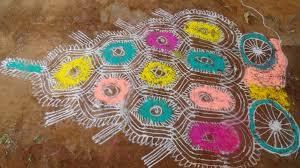 Sankranthi is special for rangolis made with combining many dots in an organized manner. Women prepare rangolis everyday for this whole month and on the last day of the festival they draw a chariot. 8. Elders and children enjoy flying kites and some people in coastal areas organize cockfights. 9. Mukkanuma is the fourth day of the festival when non-vegetarians cook and eat meat, fish etc., Usually, people don't eat non-veg for the first three days of the festival. 10. Traditional foods prepared for the festival are arisalu (jaggery sweet with rice flour), appalu, janthikalu (hot snack prepared with rice flour and besan) and garelu (prepared with black gram). I wish you all a very Happy Sankranthi. Image courtesy: Google images labelled for non-commercial reuse.